RULES OF SAFE PLAY AND GENTLEMANLY CONDUCT. ALL A.P RULES ARE THERE TO ENSURE YOU HAVE A SAFE AND ENJOYABLE DAY. MINIMUM SITE AGE LIMIT 12 YEARS OLD. 1. Players must sign a disclaimer and hold a airsoft plantation site safety card before entering the game zone. 2. Players cannot enter the game zone with out permission from the marshals. 3. Players under the age of 18 must be accompanied by a parent or guardian. 4. Airsoft plantation advises all players to wear full face protection, over 18s can choose to wear ballistic eye protection only. 5. Players under the age of 18 it is mandatory to wear full face protection. 6. Players must not remove their eye protection anywhere in the game zone. 7. Be aware of trip hazards look out for your safety and the safety of others around you. 8. Ground level sport, no climbing. 9. No real weapons allowed anywhere on site. 10. No selling equipment, bbs, pyros, or airsoft r.i.fs anywhere on site with out prior approval from a head marshal. 11. no drugs or alcohol to be consumed or brought onto site. 12. Only site approved pyros allowed on site, any pyros brought onto site must be approved by a head marshal before they are used in game. no 12g shot gun blanks. 13. all guns have to be chrono’d before they are taken in to the game zone, any player found using a hot gun is knowingly using a hot gun, chrono your guns. 14. 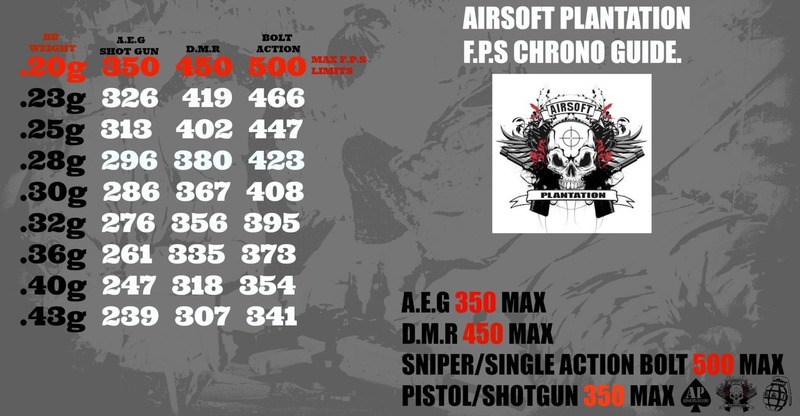 Engagement distances: sniper/dmr 30mtrs…. a.e.g/pistol/shotgun 30mtrs fully auto…. gentlemanly when it gets close. for DMRs we like to see one bb in the air at a time no rapid single shot fire a DMR is not an MP5 with a scope. support weapons to be used in a supportive mannor and are not for cqb engagements. 15. Pyro kill zone 10mtrs man made structures are deemed hard cover, trees and bushes are not. gas gas gas can kill a player yellow smoke is gas and whipes out any players cought in it (only site approved yellow smoke allowed). 16. Only players over the age of 18 can use pyros on site treat them as fire works, never touch a used pyro. 17. When a bb strikes anywhere on your body you are hit, the player must raise his hand and shout hit, and immediately follow the re spawn rules, it is then the hit players responsibility to move out of the way. knife kills are to be taken silently and count as a kill. 18. Players can never cross a blue rope neither can they shoot over or draw fire towards a blue rope, players must fight away from the safe zone areas. 19. Players cannot enter the surrounding bridle paths or public areas beyond the conifer tree line. in the woods players cannot cross the ditches into the adjacent fields or cross over the earth wall into the fisheries and public areas. 20. No magazines allowed in any weapons any where in the safe zone or public areas, no gaining ground by cutting through the safe zone during games, no dry fireing in the safe zone. 21. All guns must be cleared before entering the safe zone at the end of games. 22. All players must listen to the marshals, marshals word on the field is final. if you have a problem see a marshal do not confront other players, marshals are there to help. 23. Players must be quiet and listen during game and safety briefs, players not ready to go out with everyone else may be asked to sit out of that game. players are asked to follow the objectives and work as one team. 24. Do not destroy our site props they are there for everyone to enjoy. 25. 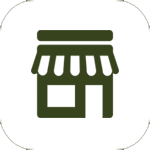 There is no shouting or abusive behavior anywhere on site. 26. Over kill is unnecessary, single fire when it gets close,no shooting over barriers or walls, no blind firing, one shot one kill. give players enough time to react to being hit do not shout at players for hit taking see a marshal. 27. Gun hits count, go to secondary weapon if you have one or take a life. 28. Treat other players as you would like to be treated yourself, airsoft is a game of honesty. 29. Dead men dont talk, take your hits, play like a gentleman do not shoot at or towards the public, live animals, players cars or farm property. 30. No fires allowed anywhere on site unless instructed by a marshal, players are not allowed to attempt to put fires out, raise an alarm and wait for the marshals, do not destroy or play with site fire fighting equipment found around the site. 31. Only marshals can drive the site vehicles and drivers are not in play. be aware of the hazards around slow moving vehicles. 32. Look after the site facility’s and clean up after yourself. 33. Come and go quietly, respect our neighbors. 34. Keep rubbish on you in the game zone and use the bins provided in the safe zone. 35. Do not touch another players kit. 36. We advise all our players to wear suitable footwear and clothing. 37. site approved pyro only!! !….please ask a marshal before using anything you have brought with you to site. 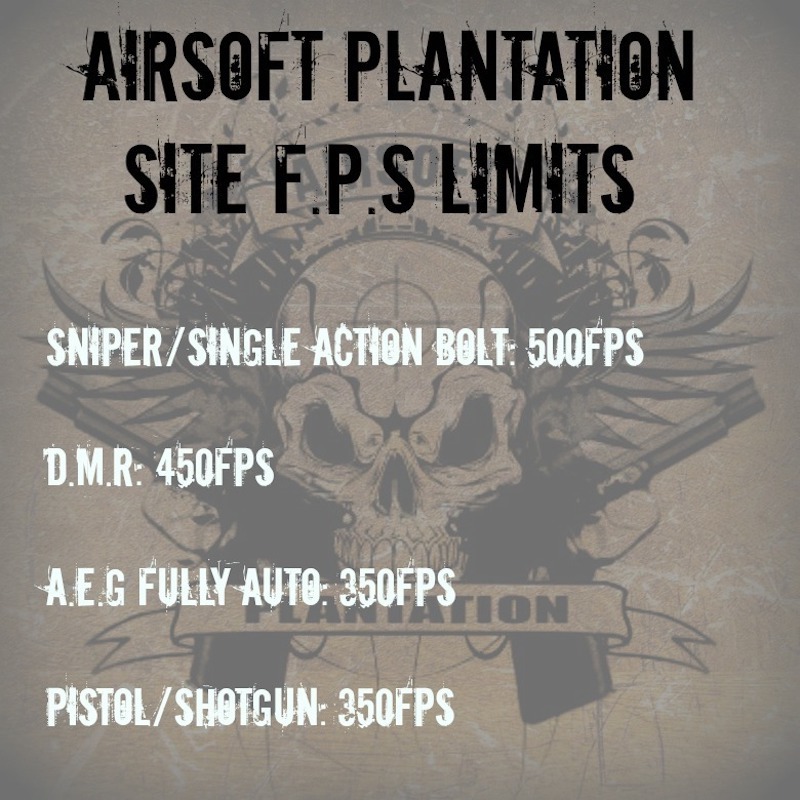 OBVIOUSLY THERE IS A MILLION MORE RULES THIS IS JUST A SHORT LIST OF THE MOST FREQUANTLY ASKED ONES, PLAYERS CAN FIND THE CONCISE BOOK OF OUR SITE RULES ON GAME DAYS ON SITE AT AIRSOFT PLANTATION. A.P DOES NOT HOLD ITS SELF OR S&J ACTION SPORTS LIABLE FOR YOUR SAFTEY, THIS IS A DANGEROUS SPORT WITH A HIGH RISK OF INJURY, PLAYERS ARE FULLY AWARE OF THE DANGERS INVOLVED AND ARE CHOOSING TO PARTICIPATE AT THEIR OWN RISK OF INJURY. WE WILL DO OUR BEST TO KEEP YOU SAFE BUT WE NEED YOUR HELP TO DO THIS PLEASE LISTEN TO THE MARSHALS.